If you ever wondered how hot does the Bitmain AntMiner S1 Bitcoin ASIC Miner get when operating and mining for BTC now you can get a better idea about the temperatures thanks to some thermal images that we’ve made of one of these BTC ASIC miners. 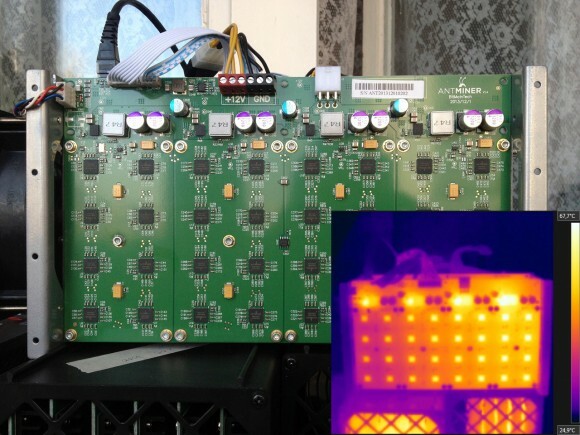 The AntMiner S1 has the cooling radiators on the other side of the PCBs and not on the one where the SHA-256 mining chips are placed, so the operating temperature of the chips is not so low. 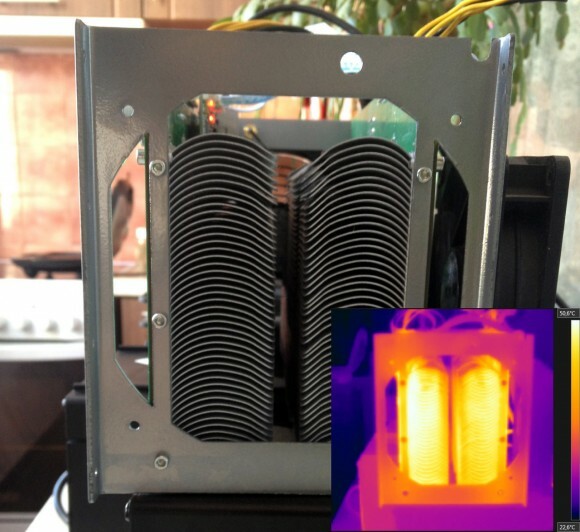 Running at the default hashrate of about 180 GH/s you can see temperature of about 68 degrees Celsius and it is of the voltage regulators above the chips. As you can see the temperature on the left is lower than that on the right side of the board due to the fact that the cooling fan is on the left side. Moving on to the exhaust side of the AntMiner S1 cooler where the hot air passing through the cooling radiator passes you can see that on the hotter output end the maximum temperature is about 61 degrees Celsius. A the same time the web interface reports operating temperatures of about 45 degrees Celsius for the two boards with chips that make the Bitmai AntMiner S1. As you can see it is a good idea to think more about the improvement of the cooling of the ASIC miner, especially if you do plane to overclock it to 190 GH/s or even 200 GH/s. The hardware is probably able to handle pretty well higher temperatures than these, but ensuring good cooling will make it perform great for longer period of time and you would want to have that when talking about a BTC ASIC miner.